Charlierat....Thank you so much for the history on the Seroe Colorado anchor. 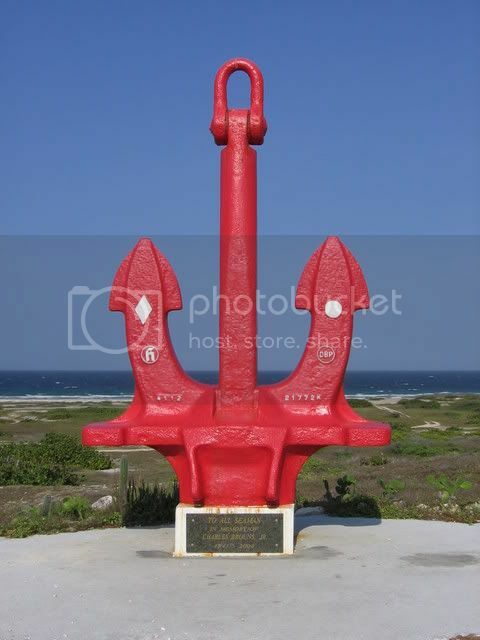 During the 90's when I lived in Aruba, I kept wondering where the anchor came from, was it really from a ship and what was the story behind it.......thanks to you, that mystery has been laid out for me. Very interesting piece and I hope they will be successful finding the ship it came from to complete the story. I sent it to a friend of mine who now lives in Hollywood Florida cause he late father in law owned Filtec and I'm not sure if she was privy to it's history as she lived in Aruba the same time I did 92-99 and that was after the installation of the anchor. She will love the history on it as we both used to wonder how it came to be there on that perch. That thing weighs over 43000 pounds?? WOW!!!! 43,000 pounds sounds like a lot until you consider that it has to hold a 320,000 ton ship in place. By the way, you're welcome for the reporting but I take no credit for it, beyond finding where someone else had posted it on the internet and copying it over here. Very good information on the anchor, let me add to the story. I just returned from Aruba last week and had gone fishing with Peter Creutzberg of Peters Divers whom I worked for under a subordinate company in the 1970's called Subsea Safaris. The other owner of Peter's Divers at that time was Jimmy DeLaFuente in Curacao who has now passed away and his brother-in-law Antonio "Toon" Segers was my boss at Subsea Safaris. I started work for Subsea Safaris on July 10, 1977. I would say it was shortly after that, Toon got a call from Peter's Divers to assist with the anchor recovery. They were using scuba and it was deep. When Toon came back to the dive shop he was worried about the bends and asked me to check dive tables, which was really too late to matter. Toon told be when he went down he actually was lucky and came across a pile of chain on top of the anchor. He tied a string to the chain and sent up a marker. In February 2013 I returned to the Aruba and met with Toon who was in the final stages of lung cancer. I did not know of the anchor and he took me to see it and was very proud of it being made a monument. Charlie Broun was a friend of both Toon and I. I taught Charlie Broun's son Charlito (Charlie III) to scuba dive. In fact I visited with Charlito on my visit last week. So I have had two close friends who have passed that were linked to the anchor saga. I'm very sure because of my dive log that the recovery of the anchor started after July 10, 1977. This last week I made my 1,000th scuba dive. I have made 850 of them in Aruba.